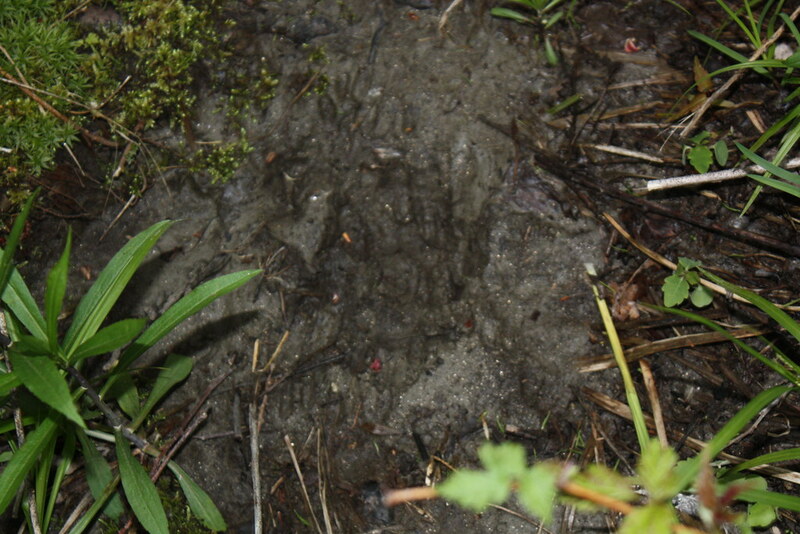 I went into the apple orchard last week and found this raccoon track on a deer path. We have had severe raccoon problems lately. A group of adult raccoons were breaking into the barn and eating chicken eggs. Then they started to eat the chickens. We lost many birds. It was a dreadful week. You never knew when you went to the barn in the morning whether the raccoons breached the repairs made to the coop the day before. John was able to shoot three raccoons — all were just huge. Nate finished the repairs on the coop successfully so that we have gone ten days now without losing anymore chickens. But the raccoons are still getting into the barn. They just can't get into the chicken coop. I had assumed that the raccoons were living in the relay shed that Comcast has on my property. They own a right of way here. The shed is up behind the house and works in conjunction with the cell tower on the ridge of Barton Mountain. While some of the raccoons may live in that shed (a tree blew down on the roof and broke the shed open), the tracks here show that some raccoons are also coming in from the east and live beyond the apple orchard. Besides the threat to the chickens, raccoons here pose another threat — rabies. There has been a raccoon rabies outbreak the past few years here in Orleans County and we are always advised to stay clear of them and to keep our dogs under control so that they are not hurt. Quebec air drops rabies vaccine every summer in the forests of northern Vermont to keep rabies out of their province. Clearly, from behaviors we observed during the height of our raccoon problem, raccoons communicate to each other. Let's hope that they have told each other to find food somewhere else.